Sheriff Mike Neal has secured beds for 20 inmates at Anderson County’s Detention Facility in order to meet the state fire marshal’s mandate issued on June 27. 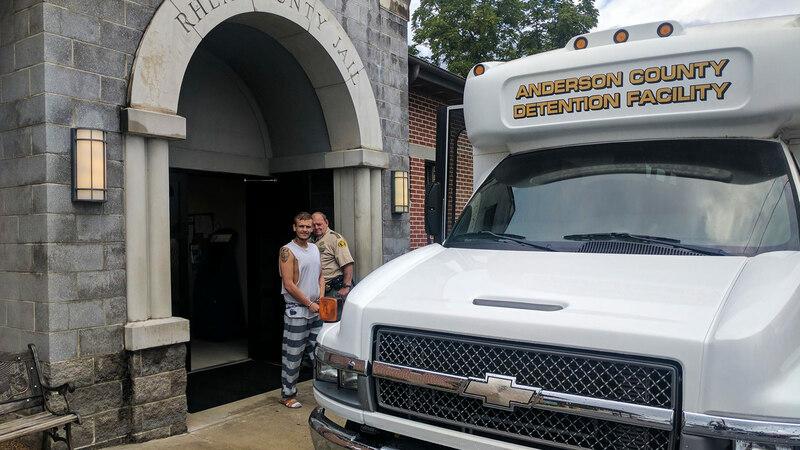 The inmates were loaded around 2:30 PM for transport en route to the 540-bed facility in Clinton, Tennessee. There are 75,749 residents in Anderson County (2015 Census) whereas Rhea County has 32,526 residents with only a 87-bed facility. The large transfer goes a long way towards reaching the mandated 87 inmates which the old jail is certified to house. Sheriff Neal says he’s thankful to find another willing facility to house Rhea County inmates and hopes to build on the relationship with Anderson County Sheriff Paul White when they meet next week. There are currently 73 Rhea County inmates housed in eight counties across the state. At $39/day per inmate, the current cost to Rhea County taxpayers is over $1,030,155 per year. Current and former Rhea County Commissions have studied the matter for seven years and have not been able to decide which steps to take in order to fix the problem. They recently opted to build the new facility at the old hospital site for the second time in less than two years. Rhea County Jail was first placed under a plan of action by the Tennessee Corrections Institute in September of 2010.